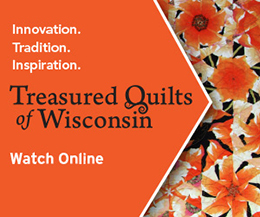 Take an exciting quilting adventure with a variety of quilt blocks, techniques and color options. The result is a stunning Sew Hometown quilt—by Amy Ellis and Heather Valentine—that is sure to push you past your comfort zone, while improving your piecing skills. The Sew Hometown 2019 Desk Calendar measures 6″ x 10″ tall. Each calendar page includes a monthly calendar on the front of the page with a quilt block pattern on the back. Stitch 3–5 of each of the quilt blocks and create a throw size quilt measuring 67″ x 79″. Amy and Heather designed the quilt blocks to be simple and fun, with a hint of a challenge—to grow your quilting skills. The Sew Hometown 2019 Desk Calendar includes 12 quilt block patterns, a layout guide, and finishing instructions. Amy and Heather designed The 2019 Sew Hometown Quilt to be made with fat quarters and scraps—to make your very own one of a kind quilt. While perusing The 2019 Sew Hometown Quilt Block options of hometown trees, houses, butterflies and more; we were immediately drawn to the April Hometown Block, titled “Flutter.” The NZP Team is very familiar with the Flutter Block, and Sewing With Nancy fans will also know this block as the versatile “Modified Quarter-Square Triangle Block” from Nancy Zieman’s No-Hassle Triangles Quilt Blocks Series! Learn how to sew a dozen super-quick Modified Quarter-Square Triangle Blocks using the speediest, most accurate, no-math, “Nancy Zieman” way. Make sure you are subscribed to Nancy Zieman Productions enews—so you won’t miss a thing. Sign up today! Join us on Facebook, Pinterest, and Instagram. All seam allowances are scant 1/4″ unless otherwise stated. Each block is a 6-1/2″ (6″ when sewn into a quilt). For our twelve super-quick Modified 1/4-Square blocks, we chose the following fabrics from Nancy Zieman’s NEW! Afternoon Picnic Fat Quarter Pack from Riley Blake Designs, and used the Nancy Zieman’s No-Hassle Triangle Gauge by Clover. 1. Cut crosswise fabric strips. Spray starch fabric or use starch alternative, such as Best Press or June Tailor’s Quilter’s Starch Savvy. Stack two starched fabric strips, Afternoon Picnic Cream Tonal and Afternoon Picnic Black Gingham, right sides together. Cut one 7-1/2″ crosswise strip, from each of the two fabrics. Cut one 7″ crosswise strip, from Afternoon Picnic Black Main. Subcut strips into squares—also known as block sets. Cut three 7-1/2″ squares from Afternoon Picnic Cream Tonal. Cut three 7-1/2″ squares from Afternoon Picnic Black Gingham. Cut six 7″ squares from Afternoon Picnic Black Main. The step-by-step photos illustrate construction of block pairs. 1. Create three 1/2-square triangle blocks. Align 7-1/2″ squares, from Afternoon Picnic Cream Tonal and Black Gingham, right sides together. Mark block sets using a No-Hassle Triangles Gauge and an erasable gel pen. The left side of the gauge is designated to create 1/2-square triangle blocks. Depress button on sliding portion of the gauge and move to size of the desired 1/2-square triangle. Place No-Hassle Triangles Gauge on block set, corner to corner. Match corner marks of gauge with corner of block sets. Mark fabric through center of gauge with an erasable gel pen. Attach Patchwork Foot to sewing machine (optional). Set machine for straight stitch 2.0–2.5 mm. Align foot along one side of center mark, stitch. Do not cut the thread. “Kiss” the next block set to the stitched block, and chain stitch from one block to the other. Rotate blocks 180 degrees, and stitch the second side of the blocks. Continue chain stitching until all three block units have been stitched. Clip threads between chain stitched blocks. Cut the blocks apart along center markings with rotary cutter, ruler and mat. Press seams to the Afternoon Picnic Black Gingham side of the squares. Align each 1/2-square triangle unit to one 7″ Afternoon Picnic Black Main square, right sides together. Mark as a 1/4-square using a No-Hassle Triangles Gauge and an erasable gel pen. The advantage of using the No-Hassle Triangle Gauge is accuracy. It’s easy to double-check that the block set fits within the confines of the gauge. If the block set extends beyond or is shorter, trim or cut another block. Using a rotary cutter, ruler and mat, cut squares into modified 1/4-triangles. Press seams to the Afternoon Picnic Black Main side of the square. 3. Lay out blocks into desired quilt pattern. Rotate squares as necessary. Nancy Zieman’s No-Hassle Triangles Quilt Blocks book shows how to create this block and 11 others. For best results, use the No-Hassle Triangles Gauge. Watch No-Hassle Triangles Quilt Blocks (Part One and Part Two) on The Best of Sewing With Nancy online. Longtime friends, Amy Ellis & Heather Valentine are fabric lovers that savor every scrap in order to make the most of their stash. Visit Amy and Heather over at the Inspiring Stitches Blog. Go ahead and grab your scrap stash, pull your fat quarters, and sew your very own Hometown Adventure Quilt with Amy and Heather. For a chance to win a copy of Amy & Heather’s Sew Hometown by Inspiring Stitches, please leave a comment below. April is National Serger Month! Celebrate with Baby Lock! Thank you, Heather and Amy, for including the NZP Team in the launch of your new Sew Hometown 2019 Desk Calendar! Be sure you’re subscribe to the Nancy Zieman Productions enews—so you won’t miss a thing. Sign up today! And, join Team NZP on Facebook, Pinterest, and Instagram. Such a bright and happy quilt!. Would love to win this pattern and complete the quilt for my granddaughters! I wish I would have had Nancy’s HST tool last week! I taught my son’s 7th grade class HST’s to make a quilt for their teacher. Love this quilt! Can see using the blocks in other projects as well. Thanks for the opportunity to win the pattern. I love the clear directions and pictures. This makes learning fun. What a beautiful quilt! Love the variety of blocks and the complementary colors! Would love to have the Sew Hometown patterns to pick different squares to try and put into quilts. Thanks for the information on the1/4 quarter triangle. I will definitely give this a try. What a beautiful quilt. A good way to use up scraps and learn some different quilt blocks. Such a bright spring looking quilt. This would give me a chance to try so many new blocks! What a fun quilt and would really keep my interest in using many different colors and fabric scraps! Great idea- thanks to the quilt makers and authors!. This look like a really fun quilt! Would surely keep my interest with all the different blocks and a great way to use many different colors. Great idea! Love this Springtime quilt. It has a nice clean refreshing look. The trees and homes are sew cute! Your quilt is beautiful and the fabrics you used are stunning. Now that I have the first part of the multi-material block figured out successfully sewn for a prior quilt top, its time to try a block with 3 materials. Also this color combo is good looking together. What a great way to use scraps. This is a very interesting quilt that offers a surprise either in color or design wherever you look. This is delightful. Beautiful colors too. There are so many layout options. What a lovely quilt! The great variety of blocks and techniques are perfect for scrap quilting. What a delightful breath of Spring — and much needed at this time of the year. Thank you for sharing! I would love to receive the calendar and patterns to continue my journey into Spring 2019! pj stitches! Would be a great project to work on when you only have a few minutes a night! Love the colors they used too. What a beautiful quilt! Would love to get the book and make it using my massive stash of scraps. So much fun! 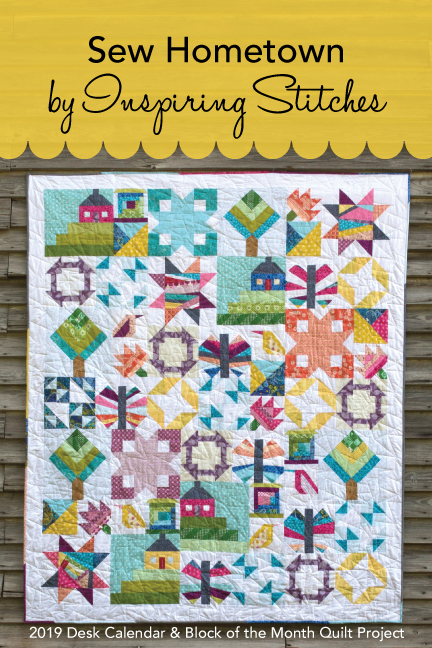 Scrap quilts are my favorites to do–This looks like a wonderful book! Different designs brings out the creative outcome of everyone. The Hometown Adventure Quilt is so charming with a very homey feel to it. What a super way to use fabric scraps that will your heart over! Thisn looks like fun! I definetly have a lot of stash to use up, Thanks! I have been sewing for over 70 years. This would be a super project to use up my stash collection. I do a lot of sitting so would have plenty of time to complete this lovely piece. Always happy to see more block designs…can never have too many! I love the quilt! It would be a great design to use up some of my stash! Beautiful quilt and fabrics. This is a project I would love to make. Hats off the talented makers! Another fun project to put on my list! I enjoy seeing and learning about all of these block ideas! Thanks! I love this quilt it is beautiful. My daughter would really enjoy this as well. Thank you for all the wonderful gifts you give and the chance to win this calendar. Wow! All those patterns put together makes such a pretty quilt. Thank you for a chance to win this! Looks like a perfect book for trying new blocks. Thank you for chance to win. Thought I’d never do another “sampler” quilt but I LOVE this one, the layout is so fun, and the fact this pattern is a calendar, WOW, how cool is that? A Quilt calendar with patterns is appreciated and fun. The blocks seem whimsical and make you smile. In a busy life, a block a month is do-able. Thank you. Thank you for offering this GIVEAWAY for a great book. And also thank you for the PDF for The Sew Hometown 2019 Desk Calendar. I can’t wait to download it. I think this book would make a great gift to give to a friend who is learning to quilt. Love that book! Love everything that Nancy does. What a pretty quilt. Looks like fun to make. Thanks for the chance to win. Nancy found talented ladies (and men) and they in turn found Nancy. The quilt is beautiful and the directions are clear and easy to follow. Thanks to the creators for sharing with devoted Nancy followers. This block/calendar is inspiring. Would love to have the patterns/book. Team NZP keep up the good work, I am loving it. What a beautiful quilt and an interesting way to make a block of the month. A great way to learn new techniques! Thank you for the chance to win. Looks like a great project. It sure looks like a fun book! Absolutely love the book – I have so many scraps just waiting for such a beautiful pattern! Thanks for the opportunity. I am also a scrap saver – what a beautiful and fun way to use up those small pieces of fabric in the scrap bin! As always, Nancy found a way to make the 1/4 square triangle blocks in a more efficient way. Love the possibilities of layouts. Also like the calendar quilt. The quilt is so fresh looking with the color choices used-perfect for starting in the spring -blocks are bright and lively. Amy n Heather looks like a very fun quilt to make. I would very much like to have the book. Thanks for your inspiring designed quilt. I like how easy these triangles are to make. Thanks for the instructions and opportunity to win this desk calendar. Amy and Heather’s quilt is beautiful. It looks challenging, but as I studied it there are familiar blocks in the throw. Oh my goodness! What fun! The options are endless with this method. I love the versatility. Now to to decide to go scrappy, or use a fabric line? Oh wait! That would mean that I could go shopping for new material! Thank you for the ideas!!! Thank you for the giveaway, I would love to have this book to construct the quilt on the cover! More material.. what’s a girl to do? This quilt is so pretty and intriguing. Oh my gosh, thanks for posting this, Its great, I love the freedom to do any square, design, make it funky, my overflowing stash thanks you also! !